Hortonworks updates platform for dataflow management and streaming analytics. Hortonworks Wednesday unveiled the latest version of its Hortonworks DataFlow (HDF) integrated system for dataflow management and streaming analytics. Together with Hortonworks Data Platform (HDP), HDF forms the core of the company's Connected Data Platforms offering. Jamie Engesser, vice president of product management at Hortonworks, says the HDF 2.0 release reflects much increased interest in streaming analytics as customers wrestle with data in motion from Internet of Things (IoT) devices, clickstreams and sentiment analysis. "We have seen significant HDF adoption across our customer base," Engesser said in a statement Tuesday. "Customers clearly want an integrated, real-time solution for streaming data and the new functionality of HDF 2.0 accelerates business value from data-in-motion for customers." HDF was born in August of 2015 with Hortonworks' acquisition of Onyara, creator and key contributor to the top-level Apache NiFi open source project. Onyara engineers formed the core of the team behind HDF, intended to make it easy for customers to automate and secure data flows and to collect, curate and analyze real-time business insights and actions derived from data in motion. Next-generation user experience. HDF 2.0 features a new graphical user experience and integration of Apache NiFi, Apache Kafka and Apache Storm into the Apache Ambari management console. "Think of it as Google Docs for enterprise data movement," Engesser says. Enterprise readiness. Hortonworks has integrated the new release with Apache Ranger for centralized and comprehensive security policy management of streaming dataflows across groups in an enterprise. "It's really about the data," Engesser says. "How do I operationalize it? How do I deploy it? How do I monitor it? How do I manage it? How do I secure it? Now all open source components get monitored and managed from one centralized console." IoT at the edge. HDF 2.0 features Apache MiNiFi, a new, lightweight edition of Apache NiFi. Engesser says MiNiFi delivers Apache NiFi in a much smaller form factor that can be installed on edge devices ranging from radio towers and power generation facilities to connected cars, providing data collection at the edge with enterprise-grade security and management at scale. "Our business depends on actionable insights from combining data-at-rest with data-in-motion at scale," Mike Bishop, chief systems architect for Hortonworks customer Prescient, a specialist in custom risk management solutions, said in a statement Tuesday. "Prescient pulls information from 49,000+ sources to determine which physical, health and environmental threat factors are most relevant to the business continuity and personal safety of specific travelers. Connected Data Platforms allows us to create value for our customers and are powering our real-time business of keeping travelers safe." 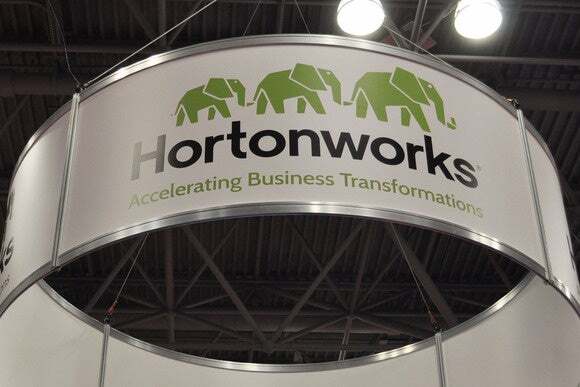 Engesser notes that the release of HDF 2.0 coincides with the addition of a new HDF Product Integration Certification program to the company's existing Hortonworks Partnerworks program. The certification program provides validation of pre-built integrations between leading enterprise technologies and HDF. It also includes testing and certification of processes to help ensure that partner software integrates with HDF. "We're seeing a large partner ecosystem develop," Engesser says. "Partners can get certified and build their own connectors." Some of the key partners collaborating with Hortonworks to certify joint solutions include Attunity, HPE Security, Impetus Technologies StreamAnalytix, SAS and Syncsort.